Gated. Four large bedroom suites, plus an extra bedroom within a suite. Three stories with a large elevator, a roof side gazebo (for children with supervision only) that has 300 degree ocean views. Fully air-conditioned, one of the largest pools anywhere, plus a flower garden that leads to the beachside Gazebo, 4 bedrooms has a large roofed terrace each. 5000 sq ft of living space, WiFi. The beach changes at times from sandy to rocky, depending on the current changes of the season, but always access for easy swimming and snorkeling, and of course large spaces for everyone to have their privacy. Maid service except Sundays (not the kitchen), we can make arrangements for cooks and other services if needed be. Walking distance to shopping areas, restaurants, night life, casinos, and several beaches. 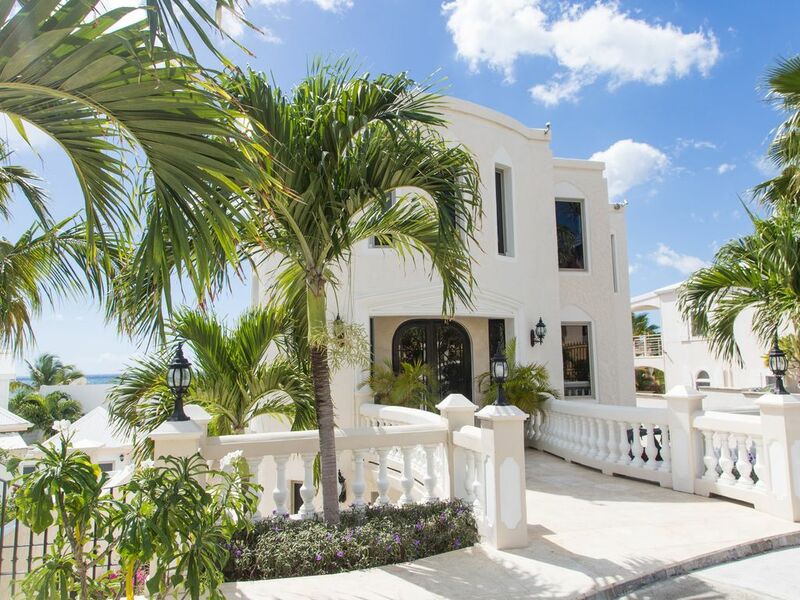 Private beach access, big private pool, beach side gazebo, roof top terrace, elevator. Great place with small issues that should be addressed. Let’s start with the good stuff. Beautiful spacious house, great pool and good location. The house was nicely decorated and clean. Now the disappointments. I would not call this property beachfront, there is a small rocky area but not a beach. The window coverings in the bedrooms all need to be replaced so you can close them and some of the mattresses need to be replaced. There were no pool toys at all. I asked Winnie from Sunshine Property’s for some and she was kind enough to bring over some noodles but some real floaties would have been nice. There were only 2 lounge chairs by the pool, there was room for a couple more. Very little glassware, we drank our wine in coffee cups. The property is gated but one of the gates was broken so it was very hard to get out of the driveway. I know some of these complaints sound petty but when you pay this much for one week everything should be perfect. Thank you for your review and updates, we apologies for the inconvenience with our minor issues that took place at your stay. We will correct them for our next visitors. Appreciate the honest review. Hope to see you again! This villa is as good as the pictures show!! We had a family of 8 adults and 3 children (ages 6, 4, and 1) and it was extremely spacious and fit our needs perfectly. The bedrooms (actually, suites) were so massive and beautifully modern. The bathrooms were equipped with showers, bidet, and toilet. Some bathrooms had 2 shower heads in the shower. The kitchen, table and outdoor seating were great and the pool was gorgeous with a waterfall. The beach was a short walk down a path and was great for the kids to play in the sand (a bit rocky to get out and swim for them though). We were within walking distance to the Pelican tourist area, which includes a deli/convenience store, piano bar, casino, restaurants, and more. We also liked how secure it was with the gate. The home had great windows that opened many different ways to catch the ocean breeze, or, if you preferred, the home had excellent AC (a must in the summer months in St. Maarten!) The property was clean and a cleaning lady came every day. They also equipped you with wireless internet, phone to the USA and island cell phone, which was great!! Towels, both bath and beach, were abundant, so don't bring any! The only concern I had was, as a mother, the stairs and pool. But all it takes is a watchful eye to keep the little ones safe walking up and down the grand staircase and being near/in the pool. Jill is the property manager and I cannot say how helpful and amazing she was too. We had many questions and could call her and she was very prompt in reply and addressing our needs. We would stay here again in a heartbeat! More Value that what you are paying for period! When we found Ocean Paradise we a bit spectacle about the property as in the picture the properties looked very Luxurious but was surprisingly cheap compared Homes of this stature. But after speaking to the Jill she assured use that it was better than in the pictures. Being that we where a large group that included my children and grand kids safety was something that I particularly want to address only to find out that Ocean Paradise was FORTRESS in every sense. We Particular enjoyed using the very large pool and outdoor terraces which had both covered and open terrace where we had BBQs. Us older folks seat in the shade while the little ones drained the energy in the pool or debated on weather to go to the beach instead. “What choices”. Obviously you figured out that we have a great time. The villa fulfilled our exceptions. We where very happy with the room sizes, views and the condition and services that the villa provided. Simply this villa offered more Value that what you are paying for period! BOOK IT AND ENJOY IT as it will have you coming back we will. We spend one of our best vacation in St. Maarten in Villa Ocean Paradise. It was so much bigger and luxurious then we expected ! But we loved it and Vittoria from sunshine properties was so helpful . THe beach was great is was soo nice to get away from toronto ! The biggest pool that we ever had in a private villa . The Kitchen was WOW huge 2 Fridges . We felt like we stayed in a presidential suite! The beds were great and the bathrooms are soo spacious truly unique and amazing.